Yoga Nidra is 75 minutes worth of the perfect antidote to a frenetically busy life and compounded daily stresses! The practice is composed of various parts: Savasana (corpse pose for deep rejuvenation), Pratyahara (sense withdrawal and the ability to quiet the mind, letting go of biased thought, opinions, habitual ways of processing information, and cultural programming), Pratipaksha Bhavana (intentionally replacing one thought with another, also known as positive thought replacement), surrender to the practice, deep breathing, focusing the mind, and deep relaxation. It is a potent synthesis of yogic techniques. As the mind settles into Yoga Nidra, the body is reminded how to relax and let go while the internal organs begin to unwind. The nervous system moves into “rest and restore” mode, blood pressure regulates, accumulated stress begins to dissipate, adrenal glands are soothed, and breathing slows and deepens. The body’s natural healing abilities are given space and allowed to do their magic, while the mind surrenders into deep peace — the peace that is your own true nature. Yoga Nidra is a practice of letting go and relaxing. There’s nothing for you to do, and no way to do it wrong. For more information, see the article here. 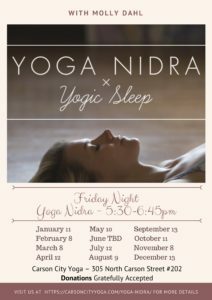 Molly Dahl teaches Yoga Nidra 2nd (usually, but check the dates!) Friday of each month, 5:30-6:45pm at the Carson St studio. This class is by donation. No need to register for this class, just come as you are!